I’d never heard of pontack until I read about it in the excellent book The River Cottage Preserves Handbook, which is by one of Britain’s master preservers, Pam Corbin. When I began researching this vinegary elderberry sauce, it seems to be an ancient British recipe, dating back at least a few centuries. The sauce, which mellows with age -- it can age for many years -- is a spicy, zingy, fruity foil for simple meats, whether they were grilled or boiled or anything else. Pontack is always associated with wild game, too, which is good; we eat a lot of that around here. I especially like this sauce with Roast Duck and Wild Rice Pilaf. 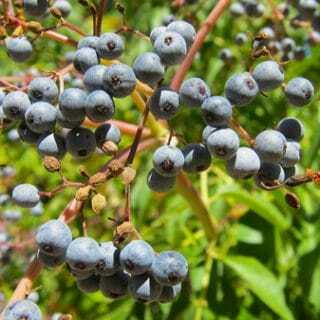 You can use fresh or dried elderberries, which are ripe all over the country between July and October, depending on where you live. 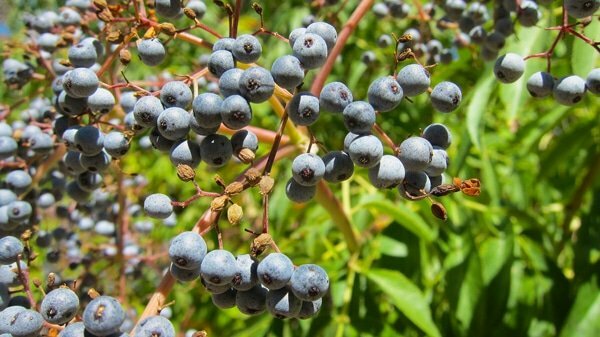 Take all the elderberries off the stems; the stems are slightly toxic, and you don't want to eat them. A couple are OK, but do your best to remove them all. Take your time, and if you are skilled, you can destem 2 pounds in less than 30 minutes. Put the elderberries into a covered casserole or other oven-proof dish with the vinegar and cook at 250°F for 4 to 6 hours. Your house will smell like fruity vinegar during this time, which isn't such a bad thing. Pour the cooked liquid through a strainer (to catch all the berries) and into a large bowl. Let the cooked berries cool enough to handle, then, with your clean hands, press as much juice as you can from the berries and into the bowl. You might need to do this in batches. Pour the sauce into a pot and add the remaining ingredients. Simmer gently for 25 minutes. Strain one more time to remove the spices. Meanwhile, get very clean Mason jars or other containers and clean lids, corks or whatever. This sauce is primarily vinegar, so you really don't have to worry too much about it going bad, but you still want clean things to put your pontack in. Pour the hot pontack into your containers and seal. Let cool and put in your pantry. Should last at least 7 years. Really. It does. Danny: Surely this picture is of elderberries, not blueberries. Sambucus mexicana, our native elderberry here in the West. I can vouch for the delicious flavour of elderberry sauce. I still have a bottle, made for me to a similar recipe to that above, around 2010. it’s still as lovely a flavour as when it was made. However, that’s our last bottle so have just picked a further 4lbs of black elderberries (Sambuca Nigrans) which are just being boiled as I write. I find it especially delicious with cold meats, or as a flavouring on top of roast venison or beef. BTW, I did once many years ago find a tree of white elderberries. Actually they were a pale green and made a respectable white table wine. I’ve eaten it many times & have never suffered any ill effects. I just strained off a batch made from 2 lbs of fresh berries. My yield is just shy of 1.75 liters. I did the initial cook in a Nu Wave oven set for 275 degrees F for 4 hours. That gadget was just made for projects like this.